Sandia National Laboratories has taken a first step toward creating a practical quantum computer, able to handle huge numbers of computations instantaneously. A "donor" atom propelled by an ion beam is inserted very precisely in microseconds into an industry-standard silicon substrate. The donor atom—in this case, antimony (Sb) —carries one more electron (five) than a silicon atom (four). Because electrons pair up, the odd Sb electron remains free. Instruments monitor the free electron to determine if, under pressure from an electromagnetic field, it faces up or down, a property called "spin." Electrons in this role, called qubits, signal "yes" or "no" from the subatomic scale, and so act as the information bearers of a quantum computer. The ability to precisely place a donor atom in silicon means that it should be possible to insert a second donor atom just far enough away, in the "Goldilocks" zone where communication is neither lost through distance nor muffled by too-close proximity. Sandia will try to do this later this year, said lead researcher Meenakshi Singh, a postdoctoral fellow. Qubits "talking" to each other are the basis of quantum computing circuits. The successful Sandia first step, reported in Applied Physics Letters, makes use of electromagnetic forces provided by a neighboring quantum dot pre-embedded in the silicon. The quantum dot—itself a tiny sea of electrons—contains a variety of energy levels and operates like a transistor to block or pass the qubit. If an available dot energy level is compatible with the electron, the transistor gate is effectively open and the electron jumps into the dot. If not, the qubit stays put. That action is reported back to the surface by a photodiode sensor sensitive to current flows rather than photon movement. Because of the multiple "gates" in the quantum dot, many qubits at different energy levels could pass through the transistor, or be denied passage, theoretically making possible an extremely wide array of information processing. 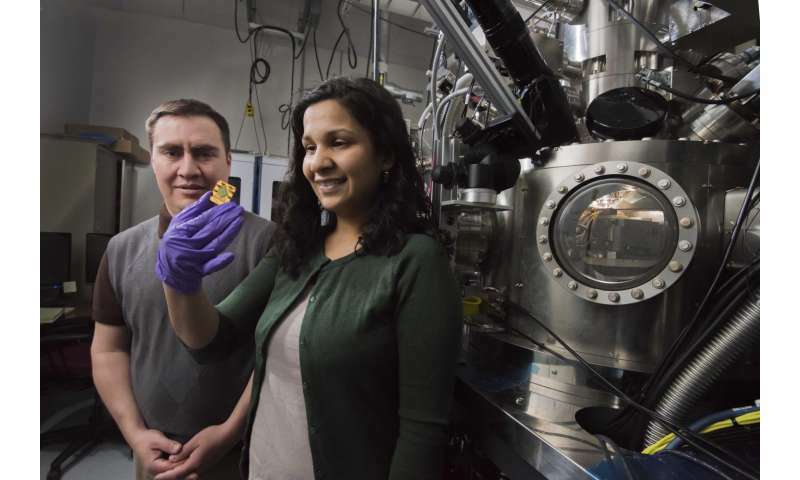 "Our method is promising because, since it reads the electron's spin rather than its electrical charge, its information is not swallowed by background static and instead remains coherent for a relatively long time," Singh said. "Also, we use silicon as our basic material, for which commercial fabrication technologies are already developed, rather than employing superconducting components that can be expensive." A third unique quality of the Sandia method is the precise and rapid placement of donor atoms exactly where they should be, placed in microseconds within nanometers of their target, instead of a buckshot approach that places qubits only where they statistically average to Goldilocks distances. While components of this experiment have been demonstrated before, this is the first time all have worked together on a single chip, with researchers knowing accurately the vertical and horizontal placement of each qubit, instead of mere statistical approximations. Sandia researcher and paper author Mike Lilly expects "the Sandia technique will allow fabrication of more complicated multi-qubit structures and do so at higher yield than existing donor implant approaches." Components of the successful silicon device were fabricated in Sandia's Microsystems and Engineering Sciences Application (MESA) facility. The donor atoms were placed at Sandia's Ion Beam Laboratory. Experiment measurements were made at the Sandia/Los Alamos Center for Integrated Nanotechnologies, a user facility supported by DOE's Office of Basic Energy Sciences. The method in its entirety is straightforward but requires a range of technical expertise and machinery, Singh said. "We used ion beams, silicon fabrication facilities, low-temperature measurements and simulations. It's hard to find a non-commercial place outside of a national lab that can do all of this."